Fall is my favorite time of year to flats fish in the Florida Keys! Fall is "Off Season" No snow birds, very few tourists, vacationing families from the main land are back to school, etc.. Most destination anglers are hunting, elk, birds, etc.. Very few boats on the flats.. Some days we don't see any.. Which means less pressure on the fish. The road, resteraunts and bars are quieter. 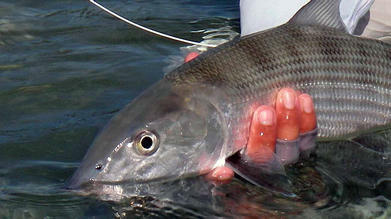 Might even get a discount on lodging too..
Polly with her 1st Florida Keys tarpon on fly. It has been a while since I updated my fishing report.. Here are some pics from yesterday.. Took Polly and Jimmy from Southern Saltwater Fly Fishing Magazine fishing yesterday. We had big fun fly fishing for small tarpon.. Found tarpon crashing bait first thing in the morning.. It was cloudy all day, which makes for difficult sight fishing,, But tarpon roll better on cloudy days. This time of year the water is warm and the tarpon will roll though out the day. Here are a few more pics from yesterday..
Polly hooked up to a tarpon at sunrise. We caught all the tarpon on Gurglers. Surface fly that imitates a shrimp swimming just under the surface. Tarpon also love surface plugs.. I prefer to use plugs with single hooks instead of treble hooks.. They are easier on the tarpon and will not foul with grass as much..
Fall is the best time of year here in the Lower Florida Keys for bonefish. On the right tides and the right days, we can find bonefish, tailing and waking..